I was perusing my news feed this morning when something caught my eye.I saw something I don't get to see often. Board games made the news today! Alas, it wasn't exactly good news. Now, granted, when I say "it made the news" I mean it showed up in the "Quite Unusual Things We Found Today" section where they have stories about the world dog-riding-on-a-skateboard record holder and the woman born with twelve ovaries. So perhaps it's not exactly above the fold. The important thing is I noticed it and now you have to hear me talk about it. Anyway, this is the story about a game. Specifically, a wargame called King Phillip's War created by a social studies teacher named John Poniske. Based off of King Philip's War, a little-known pre-revolutionary conflict between English settlers in New England and a number of Native American tribes, it's being targeted due to its violent nature and insensitivity to the Natives. The Native American tribes are protesting the fact that the game trivializes the losses they suffered at the hands of the colonists, and also paints the natives as bloodthirsty savages, an image they have worked hard to erase from the cultural consciousness. Debates like this crop up from time to time in wargaming circles.Actually, no, that's a lie. This sort of thing is never discussed by wargamers because anyone playing wargames already knows their opinion about this. It would be like the local chapter of the NRA discussing the merits of gun control--if you were for it, you wouldn't be there. But it does appear on the periphery from time to time. Some people find it difficult to separate themselves from the game and its historical context. How can you play a game, they say, for fun, when you're representing the worst of human nature? And I have to admit there's a touch of truth to it--there are certain boundaries of taste one has to consider when dealing with war. But wargames have been around for a long, long time, and very few individuals stand up and object. 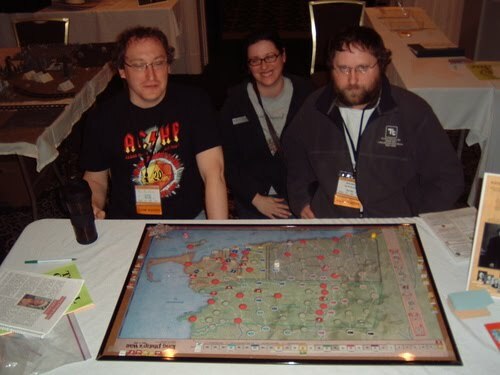 Wargames tend to be quite impersonal and most individuals can separate the historical context from what they are participating in when they play these games. Wargame designers pride themselves in historical accuracy. Many individuals learn about these little-known battles because they were drawn to a game. Making history interactive is a very useful tool in education. Reading about a battle is one thing; but understanding the decision-making process is another, and wargames do a very good job of that. Designers also have to strike a delicate balance, however, and a lot of times this is how they get in trouble. If they keep too close to the historical events, they create a game with a forgone conclusion--the real-life winner will always win the game. However, make it too even, and you'll stray from realism far enough that you're no longer presenting a historical simulation. There are plenty of game mechanics that solve this, but not all designers succeed. Those that don't aren't around for long. For King Phillip's War, part of the controversy is either that the colonists get rewarded for exterminating tribes, or the tribes get bonuses for raiding the colonists. So the tribes are either dead or savages, neither of which is ideal from a public relations standpoint. But how is this any better or worse than all those games of Axis and Allies? Someone has been playing the Germans all these years. There's probably only one reason that this made the news: The game is produced by Multi-Man Publishing. This company is known primarily for buying up the rights to Advanced Squad Leader, a "tactical" combat game that was very nearly destroyed as the markets shifted away from board games and wargames in particular. (Note that I put "tactical" in quotes not because I don't believe that it's tactical, it's that it's almost a parody of tactical--as far as I can tell, you have to roll a die to find out how many puffs on a cigarette a private takes before they get a shot off. Oh, I wish I were kidding.) Oh, and on an unrelated note, the person who spent the money to save this game is Curt Shilling, pitcher for the Boston Red Sox and Arizona Diamondbacks and oh by the way has a boatload of cash. Shilling himself has been reasonably receptive about the entire episode. His quote from the above story: "If everyone intent on keeping historical events stopped at content that might seem offensive, we'd lose sight of the horrific mistakes this nation, the world and the human race are capable of, and that would be a horrific thing." That quote seems to be the right balance: acknowledge the issue, but make certain that the project still presses forward. Making such a game is nothing to feel guilty about--it represents something that actually happened and may teach a thing or two. But even if it doesn't, so what? Which is about how I feel about the entire thing. Though I suddenly have a desire for duty-free cigarettes. Better get my 1d6 ready.